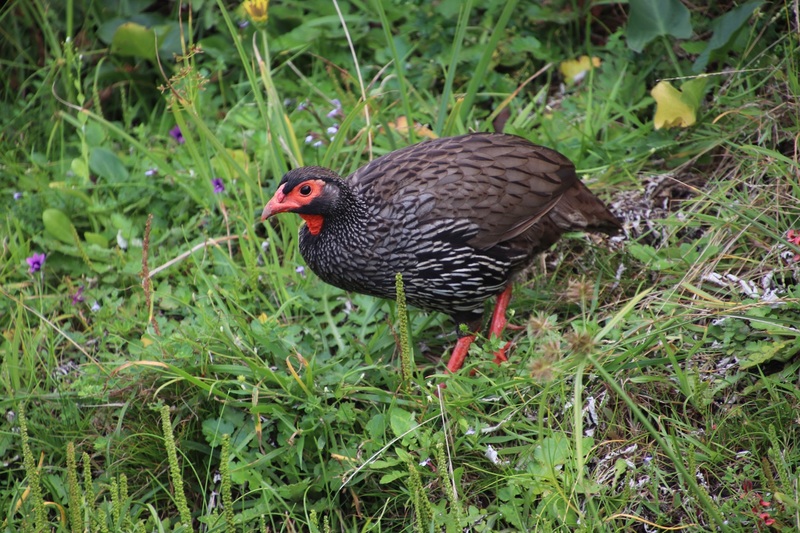 One moment nothing was there, the next a Red-necked Spurfowl emerged from the flowery bank right next to our tent. 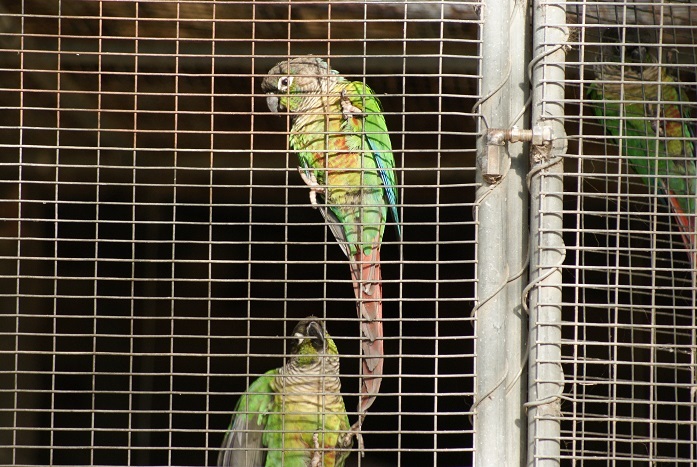 It was unmoved by our presence. 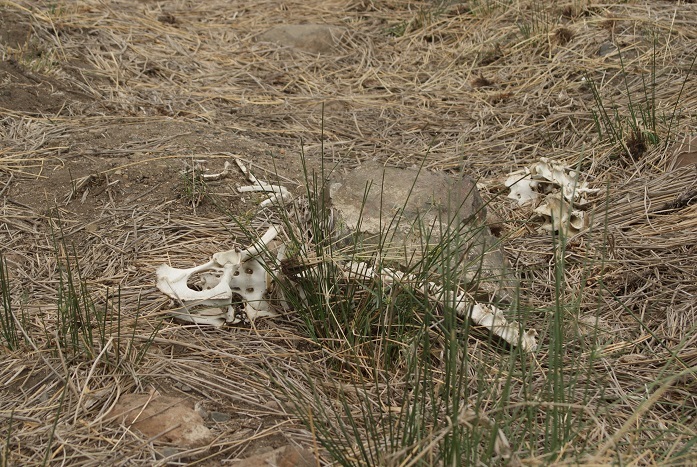 Note: Click on a photograph if you prefer a larger view. 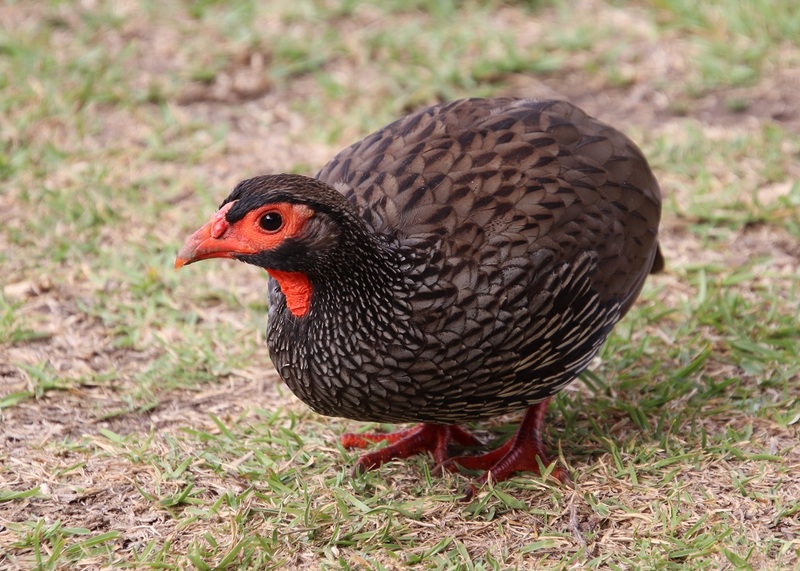 While I was growing up, most cryptically-coloured ‘chicken-like’ birds were erroneously known colloquially as ‘pheasants’ and later as ‘francolin’. 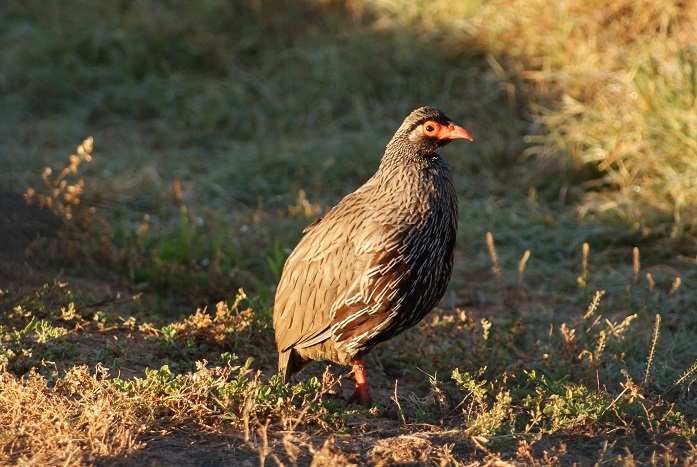 Some still are francolin, but the Red-necked Francolin has became known as the Red-necked Spurfowl (Pternistis afer). 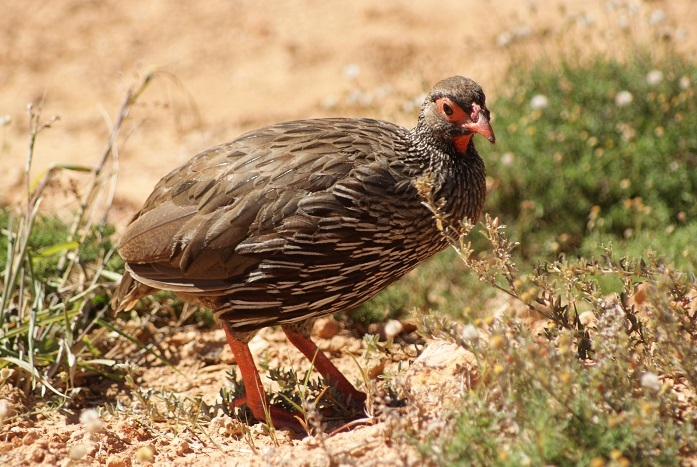 Thanks to that marvellous book, Beat about the Bush: Birds by Trevor Carnaby, I learned that Spurfowl differ from Francolins both by being more robust and usually having a maximum of two spurs on each leg. 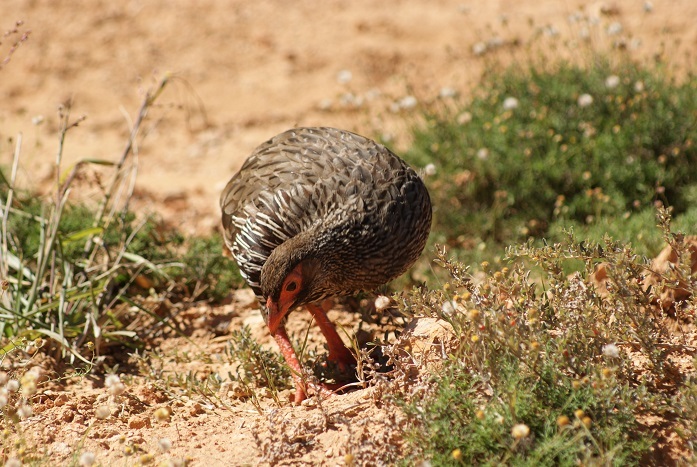 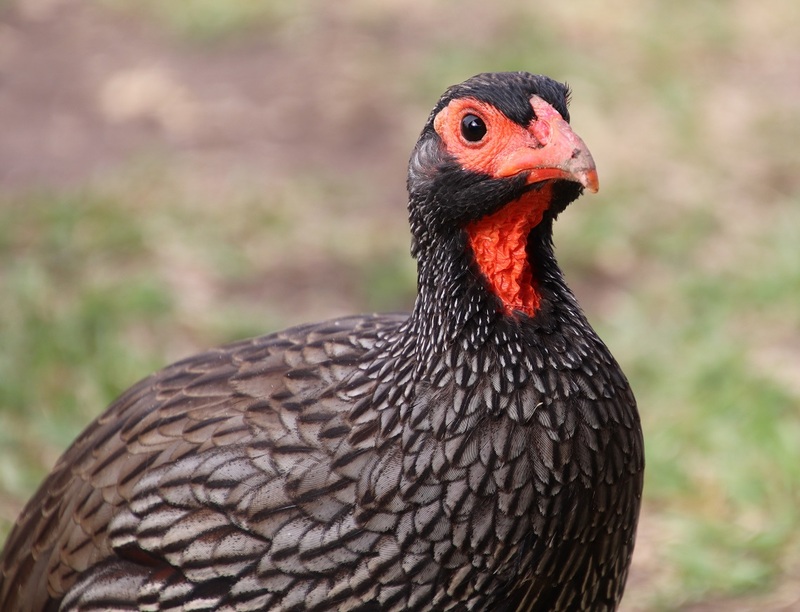 This is the only spurfowl in southern Africa with a red bill, red around the eyes, a red throat and red legs. 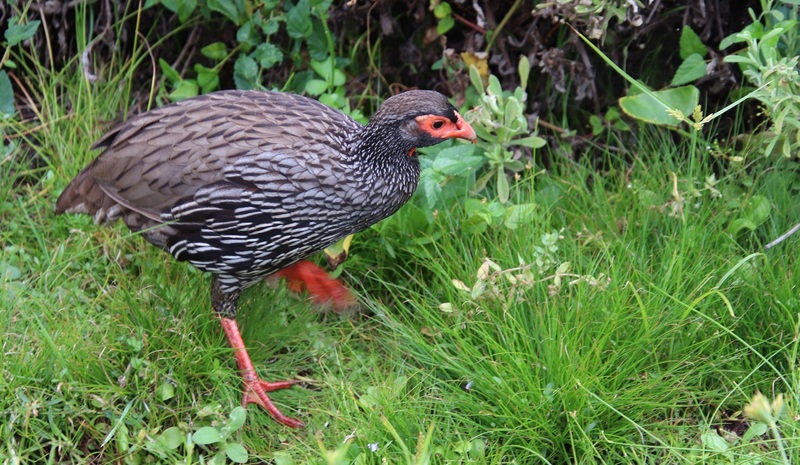 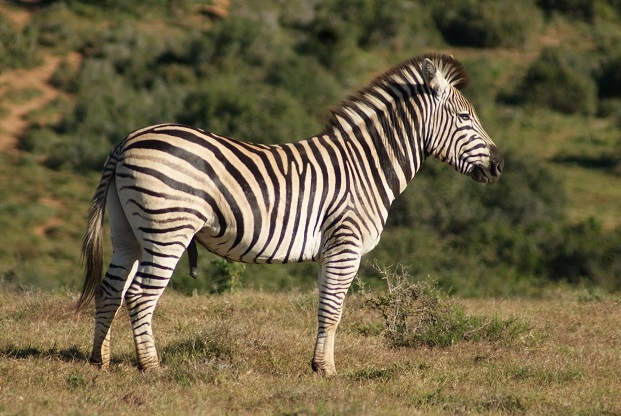 While their colouring is similar, the females are tend to be smaller and lack the spurs. 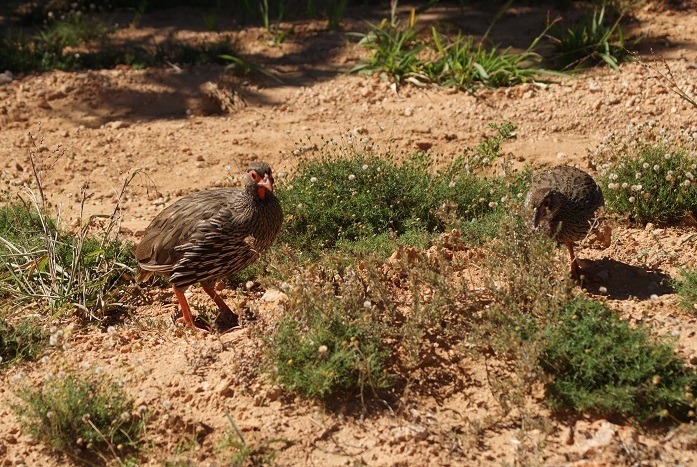 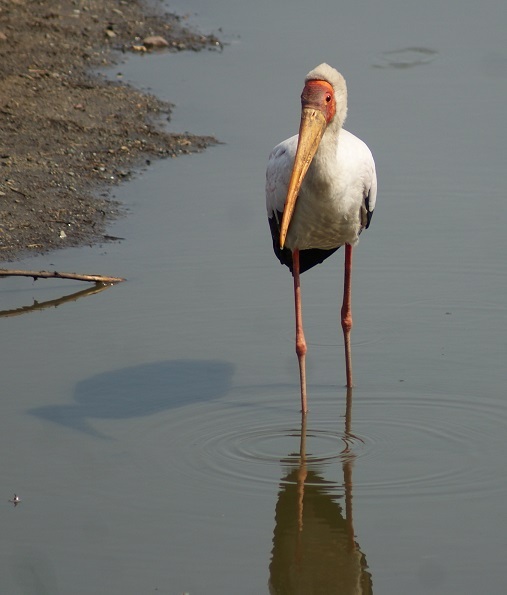 I have seen these distinctive terrestrial birds in riverine scrub, savanna and grassland areas. 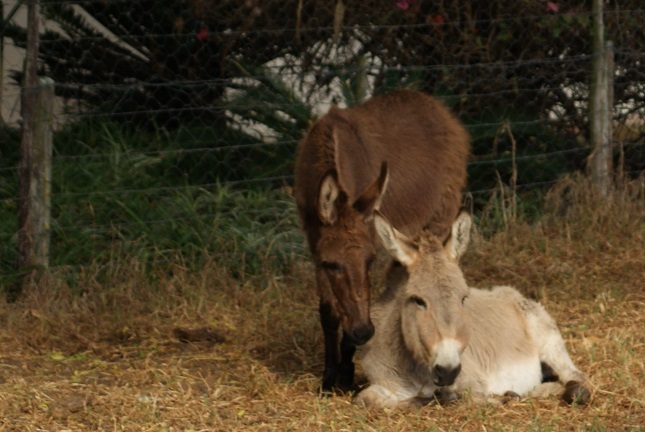 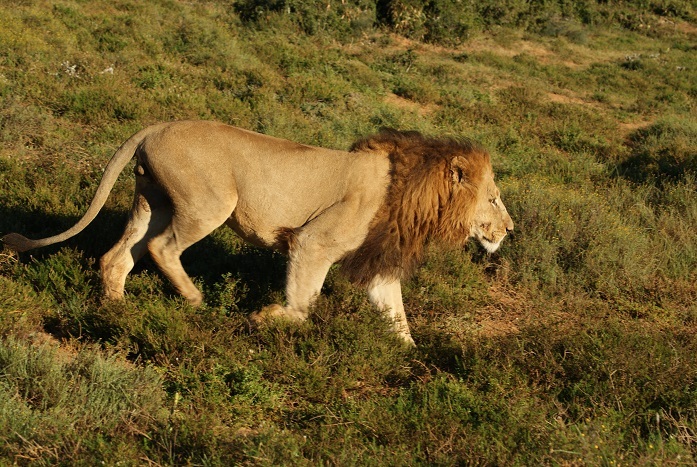 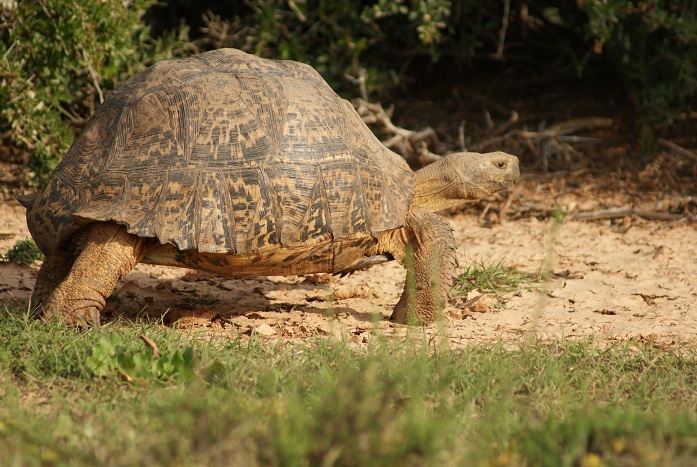 These ones were photographed in the Addo Elephant National Park. 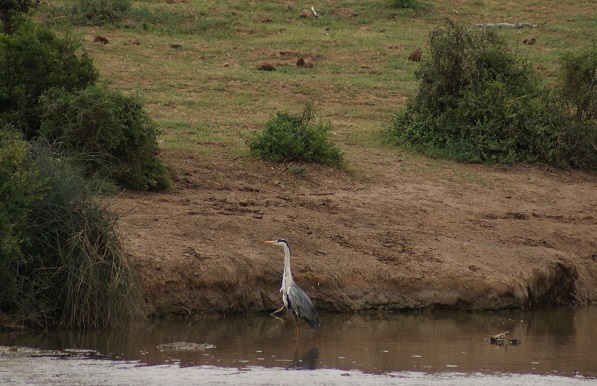 A Grey Heron contemplating the prospects of food in the Ghwarrie Waterhole. 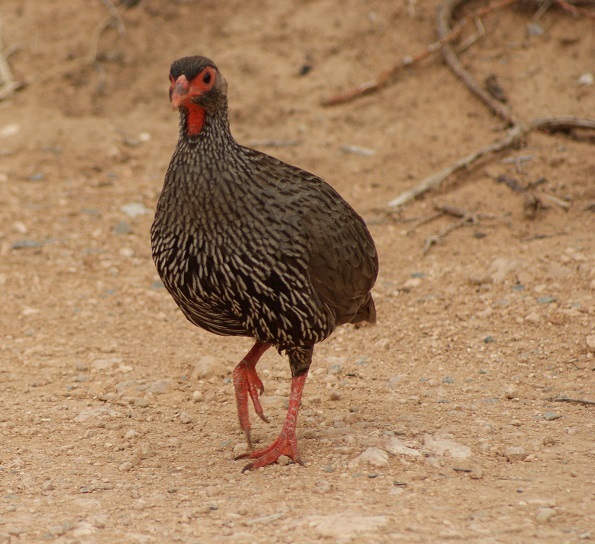 This Rednecked Spurfowl eyed us curiously as we drove past along one of the many dirt roads. 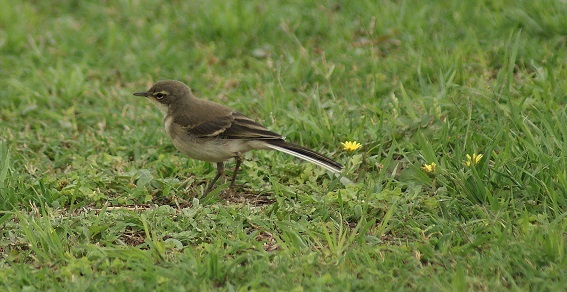 One of three Cape Wagtails bobbing across the lawn at Jack’s Picnic Site while searching for insects.